The B.C. Liberal Government has announced that they are working on changes to the Provincial Property Transfer Tax Scheme. No specifics have been announced, but the Finance Minister has stated that the changes to the BC Property Transfer Tax would be revenue neutral. What is the Property Transfer Tax? As an example, a $250,000 home would cost a first time home buyer nothing and a repeat buyer $3,000. a $600,000 home would cost a repeat buyer $10,000. What is Wrong With the BC Property Transfer Tax as it is? Good question, thanks for asking. The main issue with the property transfer tax is that the cut-off points for exemptions have been in place for years. Since then, price have grown substantially and most homes are well above the exemption now. 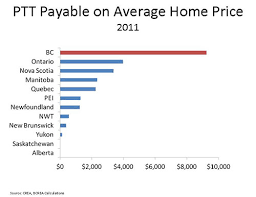 This makes the property transfer tax in BC the most expensive nationwide (see below. Analysis by the Kelowna Chamber of Commerce). This is especially painful in the Greater Vancouver Area, where house prices are skyrocketing. It should also be noted that the property tranfer tax is an out-of-pocket tax, which is not amortized into the mortgage. How Might They Change the Property Transfer Tax? The specifics have not been released. What is important to note, however, is that any changes will be revenue neutral. Essentially, any tax savings at one end will be offset by higher taxes on higher end homes. This is important, because any change in the tax system will likely be a progressive one (taxing higher priced homes more and lower priced homes less). Because the threshold is equivalent province-wide, this will likely mean an increase in property transfer taxes on homes in Vancouver, which are well above the average price for the rest of the Province.